The RSi-G Series Mini-Drive is the perfect choice for those tough industrial and OEM applications where ease of operation and high performance are required. The RSi-G is a full-featured drive with an up- and downable key pad. 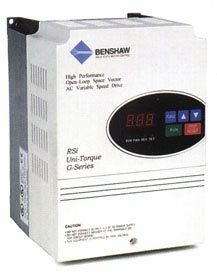 The RSi-G is compact and easy to install as either a stand alone or mounted inside a control panel unit. The RSi-G utilizes a highly advanced space vector control algorithm which lowers total harmonic distortion, torque ripple, and current ripple providing improved output voltage performance. This improved performance translates into better thermal conditions at both the drive and motor, permitting smoother operation of the application.